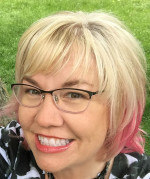 LuLu’s Rum Punch and a GIVEAWAY! If you’ve visited the Gulf Shores or Destin area on vacation, odds are you have had a meal and a cocktail or two at LuLu’s. Now you can cook the same delicious Gulf Coast goodness at home, thanks to LuLu’s Kitchen, a Taste of The Gulf Coast Good Life. I’m so enamored with this cookbook and know you will be, too. While it is not a gluten-free cookbook, so many of the recipes are either naturally gluten-free or easily modified. It’s often as easy as switching out gluten-free flour or a gluten-free bun. The focus in this cookbook is on fresh food, simple ingredients combined in a loving way to create a dish that will take you right down to the Gulf Coast. Beyond the recipes, this book is a fun read. I spent an afternoon just soaking it all in: tips on prepping food, embracing life, having a good time cooking and gathering around the table with friends. The chapter with dinner party menus is going to be put to good use in my kitchen. I’m great at rounding up a main dish here, a side dish there, but pulling it all together can be tricky. This cookbook fixes that, with menus for everything from holidays to simple picnics. I can’t believe I’ve written this far and not mentioned the cocktail recipes. Holy smokes, y’all. The chapter on cocktails alone is reason to own this cookbook. I counted eight margarita recipes and have every intention of working my way through each of them soon. 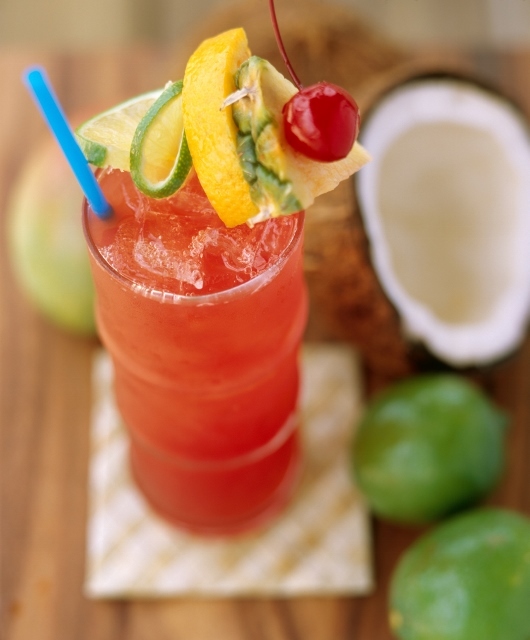 And speaking of cocktail recipes, here’s LuLu’s Rum Punch recipe for you! 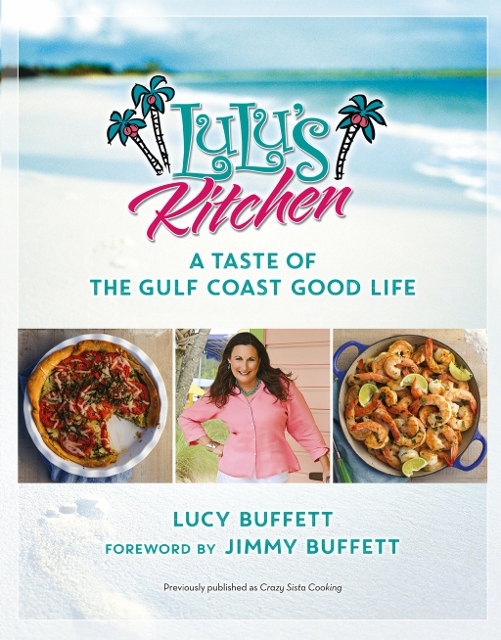 A few words on the fabulous author: Lucy Buffett, sister of Jimmy Buffett, is a restaurateur of the award winning, fun-loving LuLu’s which serves more than one million guests a year at two locations, one in Gulf Shores, Alabama and the other in Destin, Florida. Lucy has also been recognized for her tireless work on behalf of sustainability and the environment. However, the greatest passion of this self-proclaimed gypsy rebel and reluctant entrepreneur is cooking good food for the people she loves. 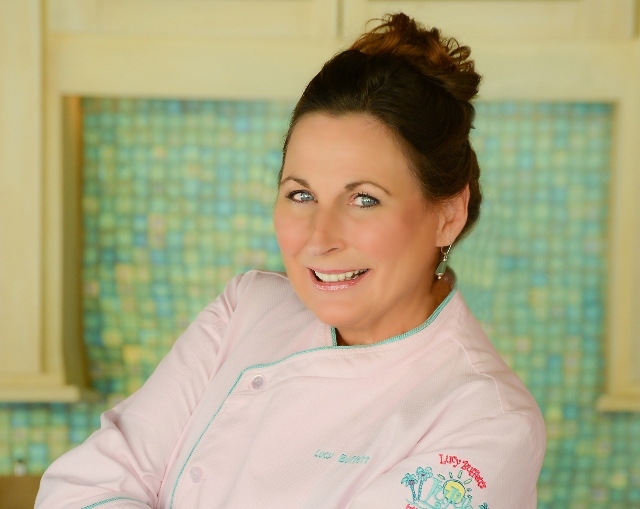 LuLu’s Kitchen: A Taste of the Gulf Coast Good Life (formerly Crazy Sista Cooking) is her first cookbook and is full of recipes and stories that made her restaurant the famous destination it is today. You can find more information on Lucy at www.LucyBuffett.com and you can follow her on Facebook and Twitter. UPDATE: GIVEAWAY is over. Winner Suzi F. has been contacted! And now, how about a GIVEAWAY?!? The folks at LuLu’s have graciously provided a copy of LuLu’s Kitchen: A Taste of the Gulf Coast Good Life for one lucky reader. Simply enter below and make sure you’ve used an email address where I can contact you if you win. Giveaway ends on May 14th, 2016. Winner will have 48 hours to respond to notification of winning; if no response, I’ll choose another winner. Good luck! Disclosure: I was provided with a complimentary copy of the cookbook featured in this post, as well as one copy for a reader to win in the giveaway. No additional compensation was received. As always, the opinions in this post are mine. I am super picky about promoting products and rarely do; this cookbook is a worthy exception. My full disclosure policy is available here. This looks like a fantastic and refreshing summer cocktail. I cannot wait to try this recipe! Oh, I do enjoy a mojito, too! I had a pineapple mojito in Tennessee of all places that was lovely. Any cookbook that shares info on entertaining always has me ready to host my next bash! Thanks for sharing this great cookbook, Johnna! I wish the rain would move away from you! The entertaining menus section of this cookbook is really clever. You know I love cookbooks, really all cookbooks, but this one is a really good one. We’re having dinner from it tonight. Maybe we’ll have a margarita as well! That would be a great blog tagline! 😉 Or a wonderful life motto–hehe. I want to fast forward to summer now! A lemonade shakeup with vodka sounds good right now, but on a sunny day anything cold and fruity is perfect! We rent from friends at the SanDestin Golf and Beach Resort – this will be our fifth summer spending a week in beautiful Destin! But we’ve never been to LuLu’s – we’ll have to go! Oh, you must go! And I’m super envious of your summer week in Destin. I love that area! I’m not a cocktail connoisseur by any stretch of the imagination, but this particular cocktail looks quite amazing! Thank you! It’s a lovely drink on a sunny day. How pretty would this rum punch be presented in a crystal punch bowl? Oh yes. YES!! Oh, that would be simply beautiful. love a good pomegranate cosmo!! Me, too! Pomegranate anything, but especially a cocktail. I totally missed Lulu’s when I was in Destin with friends years ago. I’m going to have to go down there just for Lulu’s now! Favorite cocktail? Hm.. I love rum-based drinks (and that one above looks fantastic. But, my all time favorite is the aviation, done by a local bar. So light and delicious! That’s funny, pick a favorite. ha! Depends on the day. 😉 I’m currently sipping a beermosa, but love to put my fresh mint to work in a mojito with my mamasita. The Wisconsin girl in me says Old Fashioned. (of course Mr. CITC would agree or just go straight bourbon) My grandpa’s birthday would have been this week and he introduced me to White Russians, another favorite. See? I can’t choose. And now you’ve added this rum punch to my list for summer! Yum! My favorite cocktail is probably a pina colada or strawberry colada or blue Hawaiian or basically anything frozen and sweet! Ha! Yay! Finally a vote for a frozen cocktail!! I love making my own cocktails especially in the summer! Me, too! Bring on the summer weather! Me, too!! I went on a Mai Tai tour of the Big Island in Hawaii. So lovely! Boy, does this sound like a terrific summer cocktail! Hope your Memorial Day weekend is off to a terrific start! I hope you had a terrific Memorial Day weekend as well!